There’s a clear way to ensure a nuclear-free Middle East, but Washington is not interested. Former Clinton and Obama Middle East negotiator Dennis Ross typically recommends that “Iran must have no doubts that if we see it moving towards a weapon, that would trigger the use of force” even after the termination of the deal, when Iran is theoretically free to do what it wants. In fact, the existence of a termination point 15 years hence is, he adds, “the greatest single problem with the agreement.” He also suggests that the United States provide Israel with specially outfitted B-52 bombers and bunker-busting bombs to protect itself before that terrifying date arrives. Zarif was referring to the regular five-year NPT review conference, which ended in failure in April when the United States (joined by Canada and Great Britain) once again blocked efforts to move toward a weapons-of-mass-destruction-free zone in the Middle East. Such efforts have been led by Egypt and other Arab states for 20 years. As Jayantha Dhanapala and Sergio Duarte, leading figures in the promotion of such efforts at the NPT and other UN agencies, observe in “Is There a Future for the NPT?,” an article in the journal of the Arms Control Association: “The successful adoption in 1995 of the resolution on the establishment of a zone free of weapons of mass destruction (WMD) in the Middle East was the main element of a package that permitted the indefinite extension of the NPT.” The NPT, in turn, is the most important arms control treaty of all. If it were adhered to, it could end the scourge of nuclear weapons. In the United States, it is a virtual cliché among high officials and commentators that Iran wins that grim prize. There is also a world outside the United States and although its views are not reported in the mainstream here, perhaps they are of some interest. According to the leading western polling agencies (WIN/Gallup International), the prize for “greatest threat” is won by the United States. The rest of the world regards it as the gravest threat to world peace by a large margin. In second place, far below, is Pakistan, its ranking probably inflated by the Indian vote. Iran is ranked below those two, along with China, Israel, North Korea, and Afghanistan. To be sure, Israel faces the “existential threat” of Iranian pronouncements: Supreme Leader Khamenei and former president Mahmoud Ahmadinejad famously threatened it with destruction. Except that they didn’t—and if they had, it would be of little moment. Ahmadinejad, for instance, predicted that “under God’s grace [the Zionist regime] will be wiped off the map.” In other words, he hoped that regime change would someday take place. Even that falls far short of the direct calls in both Washington and Tel Aviv for regime change in Iran, not to speak of the actions taken to implement regime change. These, of course, go back to the actual “regime change” of 1953, when the United States and Britain organized a military coup to overthrow Iran’s parliamentary government and install the dictatorship of the Shah, who proceeded to amass one of the worst human rights records on the planet. No serious analyst believes that Iran would ever use, or even threaten to use, a nuclear weapon if it had one, and so face instant destruction. There is, however, real concern that a nuclear weapon might fall into jihadi hands—not thanks to Iran, but via US ally Pakistan. In the journal of the Royal Institute of International Affairs, two leading Pakistani nuclear scientists, Pervez Hoodbhoy and Zia Mian, write that increasing fears of “militants seizing nuclear weapons or materials and unleashing nuclear terrorism [have led to]…the creation of a dedicated force of over 20,000 troops to guard nuclear facilities. There is no reason to assume, however, that this force would be immune to the problems associated with the units guarding regular military facilities,” which have frequently suffered attacks with “insider help.” In brief, the problem is real, just displaced to Iran thanks to fantasies concocted for other reasons. Another concern, voiced at the UN by US Ambassador Samantha Power, is the “instability that Iran fuels beyond its nuclear program.” The United States will continue to scrutinize this misbehavior, she declared. In that, she echoed the assurance Defense Secretary Ashton Carter offered while standing on Israel’s northern border that “we will continue to help Israel counter Iran’s malign influence” in supporting Hezbollah, and that the United States reserves the right to use military force against Iran as it deems appropriate. Only Iran’s shameful actions, however, “fuel instability.” The standard usage sometimes reaches levels that are almost surreal, as when liberal commentator James Chace, former editor of Foreign Affairs, explained that the United States sought to “destabilize a freely elected Marxist government in Chile” because “we were determined to seek stability” under the Pinochet dictatorship. Others are outraged that Washington should negotiate at all with a “contemptible” regime like Iran’s with its horrifying human rights record and urge instead that we pursue “an American-sponsored alliance between Israel and the Sunni states.” So writes Leon Wieseltier, contributing editor to the venerable liberal journal the Atlantic, who can barely conceal his visceral hatred for all things Iranian. With a straight face, this respected liberal intellectual recommends that Saudi Arabia, which makes Iran look like a virtual paradise, and Israel, with its vicious crimes in Gaza and elsewhere, should ally to teach that country good behavior. Perhaps the recommendation is not entirely unreasonable when we consider the human rights records of the regimes the United States has imposed and supported throughout the world. It might also be useful to recall—surely Iranians do—that not a day has passed since 1953 in which the United States was not harming Iranians. After all, as soon as they overthrew the hated US-imposed regime of the Shah in 1979, Washington put its support behind Iraqi leader Saddam Hussein, who would, in 1980, launch a murderous assault on their country. President Reagan went so far as to deny Saddam’s major crime, his chemical warfare assault on Iraq’s Kurdish population, which he blamed on Iran instead. When Saddam was tried for crimes under US auspices, that horrendous crime, as well as others in which the United States was complicit, was carefully excluded from the charges, which were restricted to one of his minor crimes, the murder of 148 Shi’ites in 1982, a footnote to his gruesome record. After the war ended, the United States continued to support Saddam Hussein, Iran’s primary enemy. President George H.W. Bush even invited Iraqi nuclear engineers to the United States for advanced training in weapons production, an extremely serious threat to Iran. Sanctions against that country were intensified, including against foreign firms dealing with it, and actions were initiated to bar it from the international financial system. 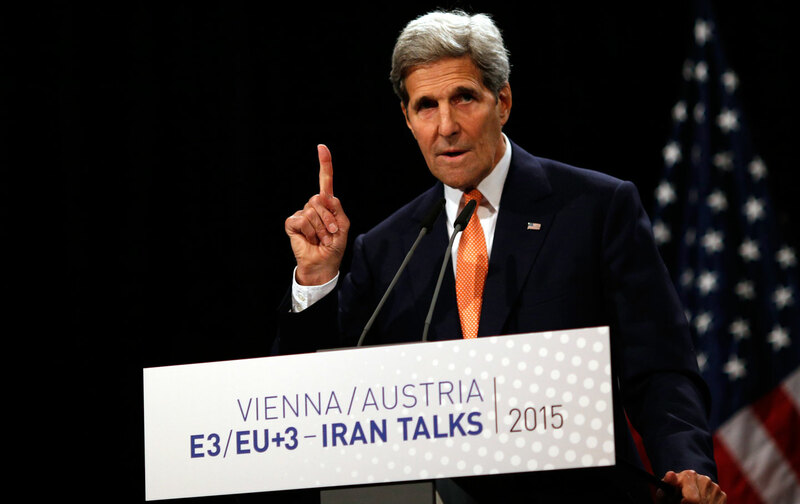 Who, then, would be concerned by an Iranian deterrent? The answer is plain: the rogue states that rampage in the region and do not want to tolerate any impediment to their reliance on aggression and violence. In the lead in this regard are the United States and Israel, with Saudi Arabia trying its best to join the club with its invasion of Bahrain (to support the crushing of a reform movement there) and now its murderous assault on Yemen, accelerating a growing humanitarian catastrophe in that country. For the United States, the characterization is familiar. Fifteen years ago, the prominent political analyst Samuel Huntington, professor of the science of government at Harvard, warned in the establishment journal Foreign Affairs that for much of the world the United States was “becoming the rogue superpower…the single greatest external threat to their societies.” Shortly after, his words were echoed by Robert Jervis, the president of the American Political Science Association: “In the eyes of much of the world, in fact, the prime rogue state today is the United States.” As we have seen, global opinion supports this judgment by a substantial margin. Furthermore, the mantle is worn with pride. That is the clear meaning of the insistence of the political class that the United States reserves the right to resort to force if it unilaterally determines that Iran is violating some commitment. This policy is of long standing, especially for liberal Democrats, and by no means restricted to Iran. The Clinton Doctrine, for instance, confirmed that the United States was entitled to resort to the “unilateral use of military power” even to ensure “uninhibited access to key markets, energy supplies, and strategic resources,” let alone alleged “security” or “humanitarian” concerns. Adherence to various versions of this doctrine has been well confirmed in practice, as need hardly be discussed among people willing to look at the facts of current history.